The Edges Of Every Canvas Paintings Are Painted And The Surface Is Covered With Clear Plastic Film Layer To Protect The Wall Paintings. Canvas Painting Are Wrapped And Stretched On Durable Wooden Frame With Hooks Mounted On Each Panel For Easy Hanging Out Of Box. 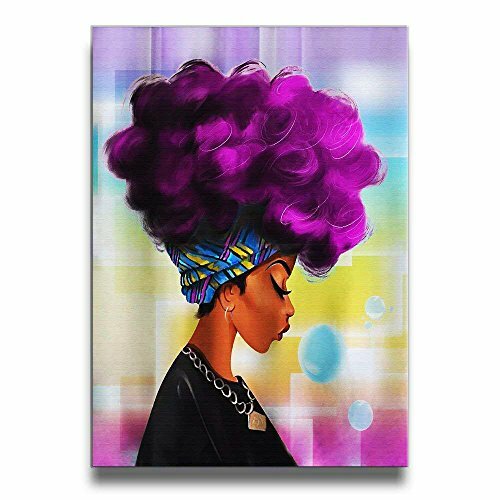 African Women With Purple Hair Frameless Canvas. Redefine Your Living Style Now With This Unique And Elegant Piece Of Art Paintings Created By Professional Artist From Mout-store Art. Use High Quality And Safe Acrylic Paint .Solid wood inner with 16/20 Inch. Painting Canvas, ready to hang. A Perfect Wall Decorations Paintings For Living Room, Bedroom, Kitchen, Office, Hotel, Dining Room, Bathroom, Bar Etc..
Fast shipping 7-14 working days to delivered. If you have any questions about this product by Mout-store Art, contact us by completing and submitting the form below. If you are looking for a specif part number, please include it with your message.